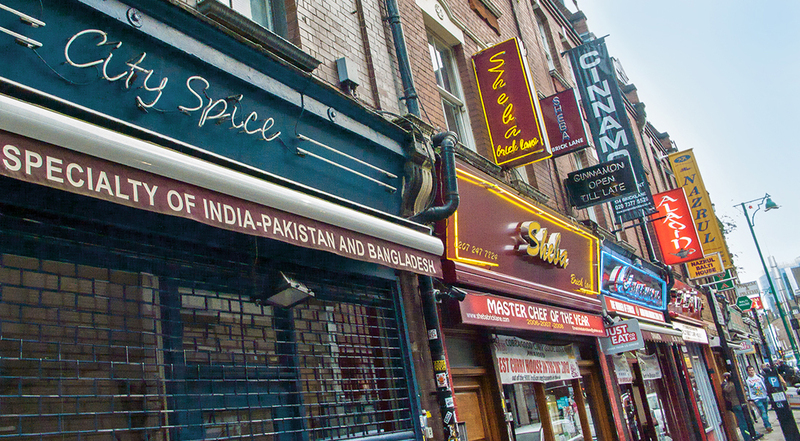 On a recent visit to London I meandered down Brick Lane in search of lunch. For centuries the area has been where immigrants found their first perch in London. These days there are a few hold-over “beigel” bakeries from the last community to dominate the neighbourhood, but now it is mostly an endless row of curry houses, each claiming award-winning balti with signs and banners in the red and green colours of the Bangladeshi flag. I found it impossible to choose a stand-out among them for lunch. Eventually I wandered up on the nearby Shoreditch High Street where my attention was grabbed by a repurposed old brick building with large plate glass windows printed with text. Whoever thought that people need café instructions? I had to go in. The interior décor is said to be in the characteristic style – dark wood and bentwood chairs, green and white checked tablecloths, several chandeliers hanging randomly from the high ceiling, rows of black and white family photos mounted into the carved wooden screens between tables. The same hectoring tone of the windows continues inside on signs posted on railings between sections, exhorting or scolding patrons toward a standard of acceptable behavior. No washing hands in plates. 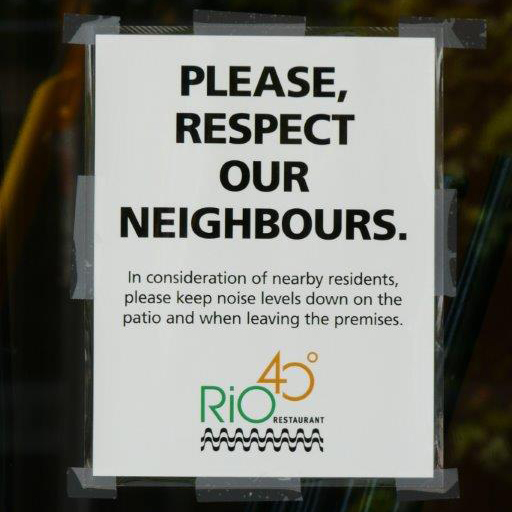 Kindly let neighbours sleep – make very little noises when leaving. And more sternly: All chai is coming strictly without opium! 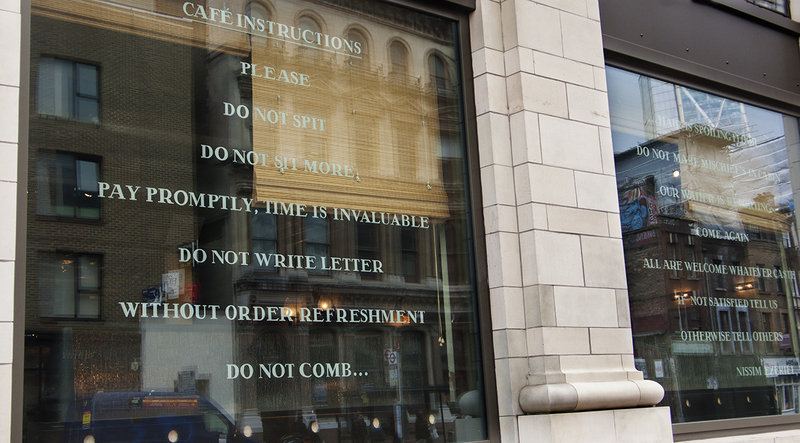 The café is replete with instructions, but who instructed the Persians and why do they think instructions are necessary? I add more questions to the expanding list of what I don’t know about world history (and the more I learn the less I know). Why did those Persians go to India? No one teaching school in Wisconsin felt it was necessary for us to know this. The menu is an informative treat to read; a paean to savory memories, to lost times and cherished company. I chose a classic black daal which they claim to simmer for 24 hours “for extra harmony”, with roti and cider. My ears are warmed all the way up from my throat by the black daal. The roti that comes with it is delicate and delicious – thinner than Albert’s, a favourite Jamaican roti place in Toronto. History ought to be taught by cuisine. Shouldn’t I know why both Jamaica and Bombay eat roti? And maybe also Persia, or which way did that influence go? Why don’t I know these things? The Blow Horn apple cider has cinnamon in it. Hot sweet. Made by a local British cidery to complement these intense flavours, its name is explained on the label: “inspired by the tailgate instructions on every Indian truck: Blow Horn as you’re passing…toot-toot.” Instructions again. As I stare, while I eat, at the instructions on the windows it is obvious that they derive from not just a different time and place, but a different point in human history and the act of congregating. They are evolved from the most basic parameters for the coming together of people outside of their tribe, their territory, language and culture, their behavioural norms; instructions for how to be in a room together, eat and drink, and not impose your customs or beliefs on the others in that room. This is how to avoid violence. I am reminded of the inadvertent cultural misunderstandings that occur while travelling or as an immigrant when we clumsily attempt conversation in any language in which we lack fluency and end up embarrassing ourselves or insulting someone when we were just trying to make an innocuous inquiry. The impulse to instruct comes not simply from running a commercial money-making establishment smoothly and profitably, but also from the genius for hospitality that appreciates bringing disparate people together and sparking new and rich associations amongst them. These rules lay the elementary playing field from cross-cultural exchanges to occur and foster a cosmopolitanism that has advanced civilization. The Irani cafés of Mumbai were an urban version of the chai khana of the Silk Roads. Leaving Persia to avoid the Muslim occupation, the Zoroastrians came to a country with strict caste, religious and class divisions. The cafés they established were an egalitarian neutral ground, a secular space where everyone could freely come together. When we have emigrated or class-jumped and our ambitions have been realized we are often hard put to find a comfortable place, one that does not pigeonhole us in the place we have so deliberately left behind, and yet does not scorn those we love from our past. Full of tasty home memories and the games of chance or songs of love or images of humble homes left behind, and populated by those we have joined in this new setting. That’s when we’d be lucky to find our own Irani café. Overtones of nostalgia, but what is the longing for? Lost people, simpler times, less commercial life… the notion that with a few basic instructions we can all enjoy being together without offending each other. We can all get along. 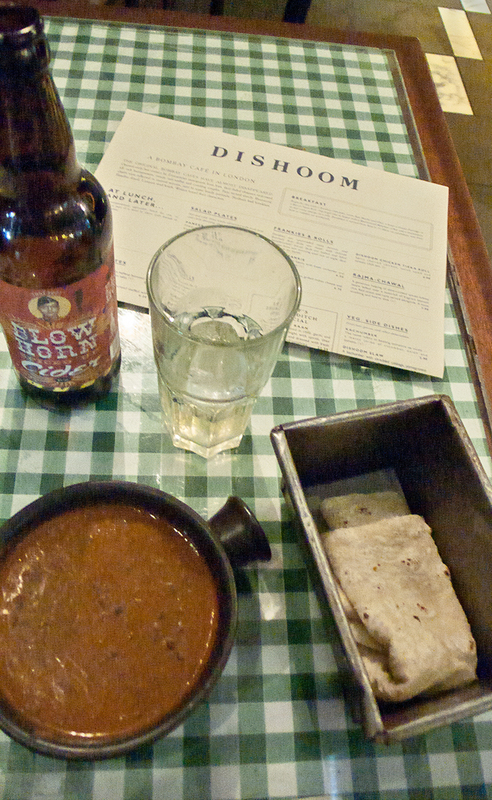 Dishoom is in essence a café of nostalgia. It is located in London and operates in the competitive restaurant scene there. Its clientele is affluent, not the broader range of classes it suggests is its constituency. It accepts these constrictions and mounts no resistance. It presents itself as an example of an alternative from the past, not an agent of change. 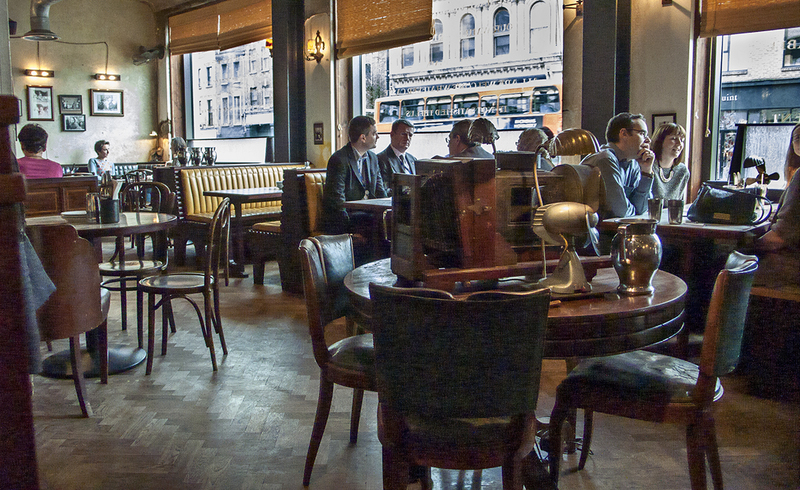 Dishoom yearns for a time when all classes and religions and nationalities could frequent the same place – a tolerance lost in contemporary times. It reminds us by its existence that today’s climate of extremism, including the maximizing of profit through workaholic competitiveness, is not the only option. Within its walls and behind its printed windows it simulates an atmosphere of inclusive civility and suggests to the world the possibility of a nourishing collective life of sociability, beauty, tranquility and delicious sustenance for all. I yearn for the instructions for achieving that.